There has been plenty of rumors floating around Buckeye country of new uniforms made by Nike for one of their three remaining games in November. It became official this afternoon when it was announced the Buckeyes will wear alternate uniforms with its showdown with Michigan November 21, 2009. The Ohio State University released this statement today. 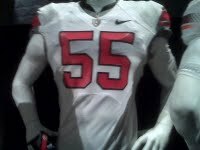 Since the entrance of the new style jersey from Nike, Ohio State has come out on the losing side of the ball in most of the big games it has played in. The new jerseys were first worn for the 2006-2007 season. This season saw the Bucks romp and stomp all the way back to the National Championship with an undefeated record, along the way taking down the team up North in the ‘Game of the Century’. I don’t need to go into too much detail about how that season ended because I know we are all well aware. That was strike 1 for the new jerseys. The following year saw another great start for the Bucks but a bit of a stumble when they tripped up again Illinois late in the season. No big deal really, they weren’t supposed to be national championship contenders that year anyway. We would have been thrilled just to get a BCS game. However, after finishing up the season with only one loss, the Buckeyes awaited Selection Sunday. Because of teams unable to win their conference championships and close out a season, the Buckeyes had “backed their way” back into the National Championship. Immediately everyone started telling anyone that would listen how the Bucks were going to get stomped by LSU and we didn’t deserve to be there. Ya, we knew we weren’t supposed to be there, but we couldn’t help it that other teams couldn’t close a season. LSU went on to beat OSU in every aspect of the game. The 38-24 score is much closer than the game was. Strike 2 for the new jerseys. The 2008 season looked to hinge on one game in particular. The away game against the USC Trashcans. This game would make or break Ohio States hopes of a bid to play in another National Championship. Surely the only way OSU would get the bid would be with an undefeated season. Well, as we all clearly know, that game did not go as planned either. The Bucks got beat like they stole something. They failed to score even a touchdown as the Trashcans seemingly did as they pleased most of the game. Strike 3 for the new jerseys. That season ended up with Ohio State getting its fourth straight BCS Bowl appearance against the Texas Donghorns in the Fiesta Bowl. After a hard fought game, Ohio State came up short once again losing its 3rd straight BCS Bowl game. For those of you who have been counting, that would be Strike 4. This is the only time in history that you can get 4 strikes without being out, bowling withheld. Why is this different for the jersey? With that being said, this is the beginning of the Thunder Nation Coalition for the Buckeyes. 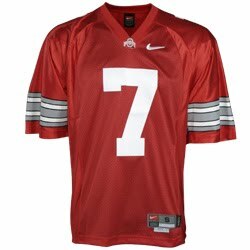 We want Ohio State Football to revert back to the jerseys that helped us beat Miami for a National Championship. We want the good, old classic jerseys with the fat scarlet and grey stripes with no sign of black on them. We want our home jerseys to scream OH-IO and not WI-SC. It is time we voice our opinion about how we really feel about the jerseys. Give it a shot right? What do we have to lose? 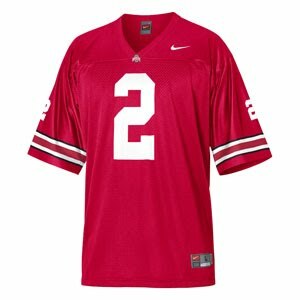 I am sure Nike would oblige to redesign the jerseys seeing as how Buckeye Nation will probably go out and buy them so they have the most up-to-date gear (i.e. best damn fans in the land). It seems like a win-win-win situation. Nike wins. Buckeye Nation wins. 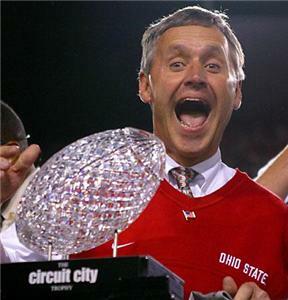 And most importantly of all, The Ohio State Buckeyes win. Click on the link at the top left of the page to sign the e-petition to join the Thunder Nation Coalition for the Buckeyes. Send the link to all family and friends. Let’s get this message across Buckeye Nation that enough is enough and its time for a change! You are currently browsing the archives for the The Ohio State University category.